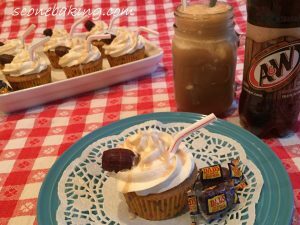 If you love root beer floats, you’re going to love these Root Beer Float Cupcakes. They have a wonderful root beer flavor in the cupcakes, then I had to top them with a Vanilla Ice Cream Buttercream Frosting (because they are root beer FLOAT cupcakes), and to give them more root beer flavor, I added a Root Beer Drizzle on top of the frosting. To make them fun and festive, I added Root Beer Barrel candies and straws. 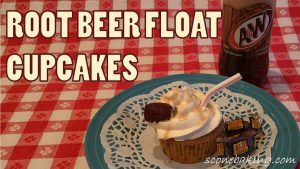 These would be great for a birthday celebration, or anytime you’re in the mood for a root beer float. Below is a link to my YouTube video demonstrating how easy these delicious Root Beer Cupcakes are to make.